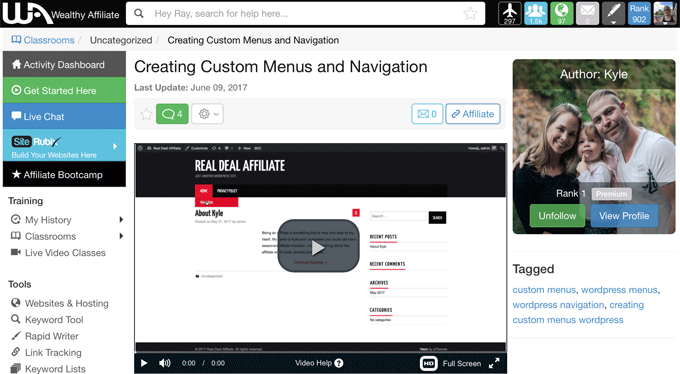 Kyle, co-founder of Wealthy Affiliate has just published a video that teaches you how to create a custom menu in WordPress. When you start building a website, you tend to focus on design and contents while easily neglecting to organise the navigation structure. It is one of the most important elements and, it becomes more difficult to fix as you build up posts with variety of topics. Kyle's training "Creating Custom Menus and Navigation" will help you to plan the most relevant menu according to your niche posts, and also to place them in the right position within your site. The video training is about WordPress menu basics. Kyle explains how to create a main (header) menu, sub (dropdown) menu, and also how to place custom menus in widgets: within the sidebar and the footer. Most of the WordPress themes allow you to locate your custom menu in both sidebar and footer, but some themes have slightly different settings so you may want to check yours. While I'm not particularly proud of the menus of my own page - I should have planned the structure more carefully - my advice is to not overcomplicate it. Too many items under a menu can confuse your readers. When you think there should be two separate categories instead of one, you should think again in the visitors' eyes whether it's absolutely necessary! If you'd like to learn how to create your own website and monetise it, you can start today. Wealthy Affiliate has everything you need to make your internet marketing business successful. Absolutely free to join - no credit card required. If you're in doubt, read my Wealthy Affiliate Review and see what you think.